Azzam al-Ahmad says that now is the time to escalate the "popular struggle" in support of the terrorists imprisoned in Israel. 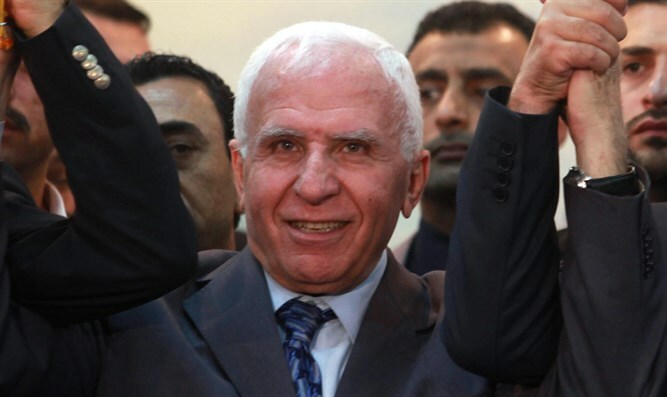 Azzam al-Ahmad, a member of Fatah's Central Committee and head of the group’s parliamentary bloc, on Sunday called for an escalation of “the popular struggle” in support of Palestinian Arab terrorists in Israeli prisons. Ahmad said that no peace agreement can be signed with Israel unless all the Palestinian Arab prisoners are released, stressing that the issue of the prisoners has dominated the national priorities of Palestinian Authority (PA) chairman Mahmoud Abbas. The PA views all the terrorist prisoners, including Israeli Arabs, as "prisoners of freedom", and provides them with monthly allowances, the amount of which stands in direct proportion to their period of imprisonment with additional benefits for residents of Jerusalem. The monthly stipends for terrorists amount to about six percent of the PA’s annual budget. Despite this, the PA continues to ask the international community for foreign donations, claiming it is on the verge of collapse due to a worsening financial crisis.